Helps with digestive health and reduces bloating and constipation. Sign up for the In2Hula mailing list to receive a free instructional video of how to spin a hula hoop around your waist, as well as perform a number of other basic moves with a hoop to tone and work your core and your arms. In2hula is working in collaboration with the Heart Foundation of New Zealand to provide a hula hoop based physical activity programme for early learning services and centres. However, the programme is suitable for use in any early childhood setting around the world and is available in a digital format for early childhood education providers outside of the Canterbury area. It’s a workout routine that’s FUN & gets RESULTS! You can do almost anything with a hula hoop: your imagination is the limit. Hooping is no longer a thing of the past. It has made a popular come-back simply because it’s fun and provides a workout routine that gets results. Have fun and lose weight learning to hula hoop in our classes. Join our positive and caring community of hoopers to experience the difference In2hula has to offer you. You will receive more one-on-one attention because of our smaller class numbers. We take the time to really listen to each person’s individual needs. This is not about blasting out a fitness class with as many attendees as possible. Our classes are gentle on the body and generally injury free! Bernadette’s energetic and heart-centred work sharing the benefits and joy of hula hooping over the last 10 years was recognised with the 2018 New Zealand Register of Professionals Award. 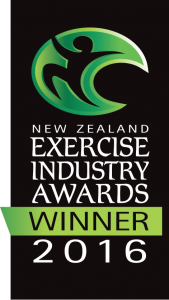 The REPs award is presented to a role model who reflects the ethics and values of exercise facilities and professionals in New Zealand.